Producers are looking to take further advantage of low natural gas prices in the US, which enables the significant expansion of methane-based projects. US chemicals production grew 1.6% in 2016, and is expected to increase 3.6% in 2017 and 4.8% in 2018, as many subsectors continue to enjoy the cost advantage of shale gas. The US has moved from being a high-cost producer of key petrochemicals and resins in the past to being the world’s second lowest cost producer. Exports of US chemicals linked to shale gas are projected to reach USD 123 billion by 2030. Chemical producers are clearly looking to take further advantage of continued low natural gas prices in the US, which is enabling the significant expansion of methane-based projects. Currently the US is a major importer of methanol, but by 2018 it will be a net exporter of this substance - a significant shift for the US chemicals industry. Like other US industries, the chemicals sector is still waiting for further clarification of the economic policy under President Trump. 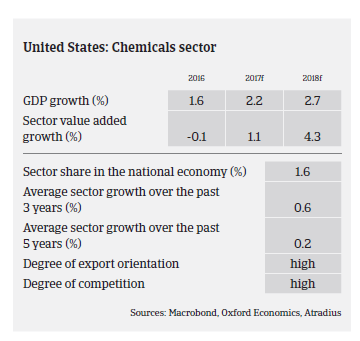 While corporate tax cuts would benefit many businesses across all US sectors, any economic stimulus policy that would boost economic performance would have a positive impact on the chemicals industry in 2018, as annual US chemicals demand growth usually exceeds year-on-year GDP growth. The large infrastructure improvements announced by the new administration (but still subject to Congressional approval) would widely benefit US chemical businesses providing polymers, coatings, adhesives, solvents and other materials used in the construction industry. The easing of energy and environmental regulations would also have a positive impact on the chemicals industry. However, there are also some potential downside risks related to President Trump´s economic policy course. Potential taxes on imports could find US chemicals businesses paying more for feedstocks and negatively impacting supply chains. 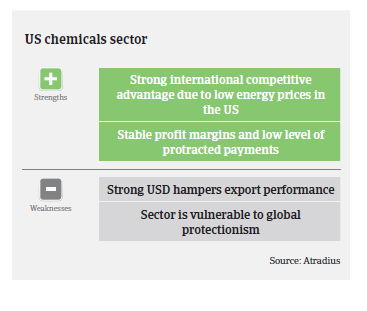 Protectionist US trade policies - followed by retaliatory measures by trade partners - would hit the US chemicals industry heavily, given its substantial trade surplus (Mexico alone accounts for more than half of the US chemicals trade surplus). Profit margins of US chemicals businesses are generally stable, and the amount of protracted payments in this sector is low. On average, payments in the chemicals industry take between 30 and 90 days. The number of insolvencies is low compared to other industries, and is expected to remain so in 2017 consistent with improving demand for chemicals. Our underwriting approach to the chemicals sector remains generally positive to neutral. As the sector is highly fragmented and dependent on the broader economy and input costs, we scrutinise single subsector trends and end-markets. We continue to focus on the financial strength of buyers as the volatile price environment settles at what appears to be the bottom, with some price volatility seen in Q1 of 2017 associated with the implementation of the new US administration. Our underwriting approach remains cautious for the energy and fuel/oil subsector, especially for smaller and local players in this segment. 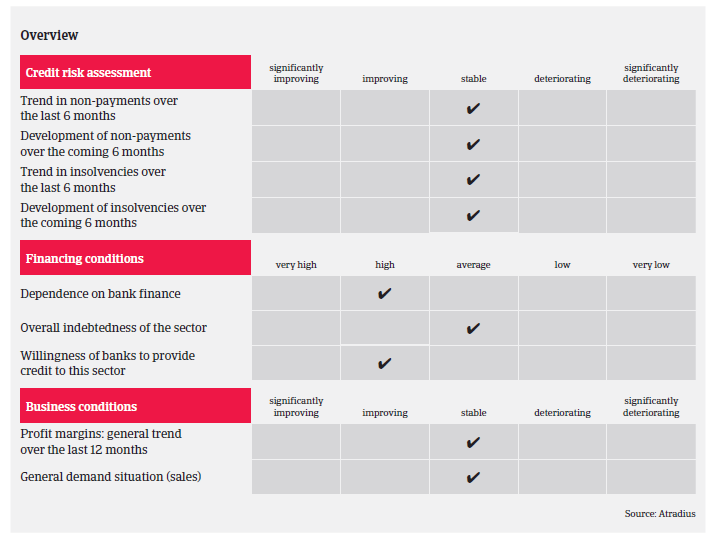 We closely monitor liquidity and business outlooks for public and private buyers in this subsector. We also closely monitor US chemicals companies that do business in countries where the local currency has significantly devalued against the USD.